Should I sell my car to CARMAX? Should I sell my car on ebay? Should I sell my car on Craigslist? 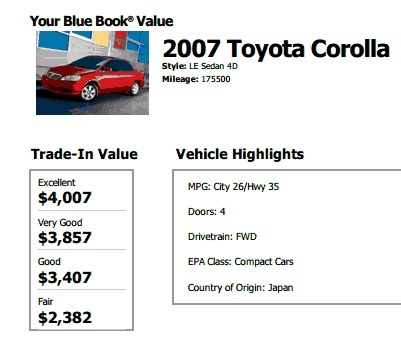 These were the questions I asked as I prepared to sell my 2007 Toyota Corolla. Back in 2011, I sold my 2009 Pontiac G5 to CARMAX. I knew from that experience how easy and straightforward the process is: bring in your car and a sales consultant will ask you a few questions. Then an appraiser will test drive the car and look it over. You will have a firm offer in less than 30 minutes that is valid for 7 days. 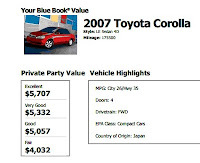 What does Kelly Blue Book say my car is worth? How much effort do I want to put into selling the car? What if the buyer changes his mind and I have to deal with that headache? 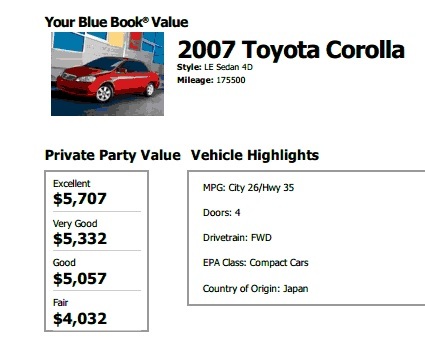 Before taking the car to CARMAX, I went online to review the estimate KBB offered. They have a Private Party Value as well as a Trade In Value. I don't see why it is necessary to have two; the difference between them is comprised of the dealer's costs and profit for taking your car and selling it for you. If I sell to CARMAX, I don't have to deal with out of state buyers, ebay fees, multiple test drives, or preparing the car to sell. Obviously the next big item is price. How much is my car worth? The Corolla has been a real workhorse. 175,000 miles in little more than six years. The dealership I bought it from wrecked it back in 2007 (just a few months after I bought it), so there was some damage that had to be repaired. I ran under a chain gate once, snapping off the antennae, scratching the windshield (which is now cracked) and damaging the roof. A friend of mine burned some cigarettes in the roof when he was drunk. It's mechanically in excellent shape, but aesthetically she's pretty ugly. 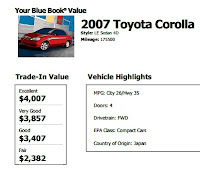 Based on kbb.com, the Fair Condition value for Trade In is $2,382. The Fair Condition value in a Private Party transaction is $4,032. I was offered $3,000 by CARMAX. I accepted. So you are car free now? I'll be interested to see how you like it. Once I get back from my hike if I get a job that wouldn't require a car I would consider giving up my car. Cars/transportation take up way too much of my budget. Not yet, but I plan to be car-free. I still have my grandfather's S-10. It can't be titled in my name until the probate process is done, which will be this fall. I'm using the truck as little as possible to see how it is being car-free. I figure I can rent a truck if I need one to work on my rental properties. Going completely car-free makes me nervous because I've never done that, but knowing there is an Enterprise I can walk to helps. We shall see.